Reconfigure shorelines, slopes, or improve depth of existing lakes to maximize recreational or development value. Revitalize lakes surrounded by homes to enhance depth, improve beaches, and improve water quality. Expand recreational uses by increasing water depth and clarity to improve fishing, boating, skiing, etc. Expand or enhance existing lakes prior to residential or commercial development. 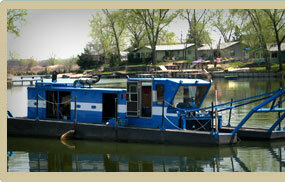 Improve boat access to docks or marinas. Enhance environmental quality by improving water flow or uncovering springs which may be covered with sediment buildup, to better control algae and weed growth. Mine-to-lakefront property conversions such as sand pit to residential lake developments. Federal, State, and City/Local Government projects such as repairs to flood damaged areas along lakes and environmental enhancements. Channel/cove development and enhancement including widening, or creation of channels connecting lakes.